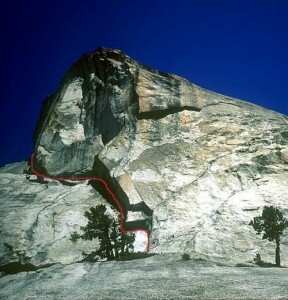 Cooke Book is one of the most overlooked climbs in Tuolumne, partially because even from the base the route is hidden. The route’s huge dihedrals wind around the north side of Daff Dome. Many see the intimidating steep dihedral higher on the north face, and assuming Cooke Book ascends this, decide on another route. This steep dihedral is an abandoned project which will likely be at least 5.13. Outstanding technical liebacking at the crux is worth the approach. Lower pitches include optional offwidth, and mandatory stemming/liebacking with intermittent protection and somewhat grainy feet. Which SuperTopo guidebooks include a topo for Cooke Book? Cooke Book, as seen from the base, curves around the north side of Daff Dome. One of the most striking crack lines in Tuolumne. Crescent Arch takes the obvious line in the middle.